In Fells Point and craving sushi? If you explore South Broadway just north of the waterfront “party zone,” you’ll find Asahi Sushi, and you’ll likely be glad you did. Asahi is a treasure for anyone in the mood for a wide selection of fresh, affordable, very tasty sushi and more. I visited Asahi on a rainy Tuesday night, with my boyfriend, James, and our friends Nate and Rachel. Upon entering the cozy eatery, we immediately forgot the traffic, puddles, and “adult businesses” just outside as we were welcomed warmly by a soft-spoken young man, and seated right away. With the slender layout Fells Point establishments are known for, Asahi is intimate but surprisingly roomy. The wrap-around sushi bar features 15 or so seats, and more than enough elbow room. Two chefs bustle behind it, slicing away at fish and vegetables. Past the bar, where we’re sitting, are about 10 tables in a small dining area. My friends and I sit all over the “sushi adventurousness” spectrum. So, we were happy to see a diverse menu, which features all of the dishes you’d hope to see at a sushi restaurant (appetizers like gyoza and tempura, Japanese dishes like donburi and teriyaki and of course, sushi and sashimi), but also several Korean dishes like bibimbap, kimchi and bulgogi. 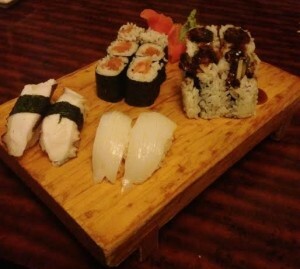 The list of sushi rolls is impressive, with more than50 different types including raw, cooked, vegetarian and tempura. Prices are generally modest. Appetizers average $6-7, and cooked entrees like teriyakis, tempura and Korean dishes range from $10-17 (the few pricier options are seafood). The sushi prices aren’t exactly a steal, but are certainly competitive with other places in the area. Asahi also offers $7.95 lunch specials on weekdays, featuring satisfying portions of dishes raw and cooked. Our sever, the same young man who greeted us, was pleasant and extremely patient with our collective indecisiveness. As appetizers, James settled on a spicy tuna roll, Rachel and Nate an order of gyoza, and I ordered a squid salad. The spicy tuna roll was filled with cucumber and big hunks of fish (not the shredded, mushy concoction often used elsewhere), covered in a peppery red sauce. “I love that the sauce seems to marinate [the fillings], instead of just being dumped on top,” James said. 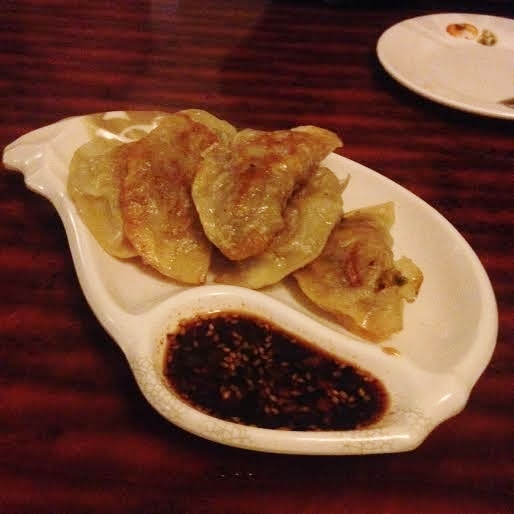 The gyoza, or pan-fried dumplings, were filled with savory beef and zippy scallions, and served with a bold, thick sauce of soy, chili pepper and sesame seeds. The squid salad was a bit small for $6.95, but delicious. Bits of tender, rice vinegar-marinated squid mixed pleasingly with crunchy bamboo shoots and mushrooms, as chopped green onions and mild chili peppers added an exciting brightness. For our main courses, James ordered the beef katsu, Rachel the California and shrimp tempura rolls, and Nate the chicken teriyaki. I went a bit overboard, with a salmon roll and salmon skin roll, as well as an order of squid and octopus sushi (two pieces of nigiri each). 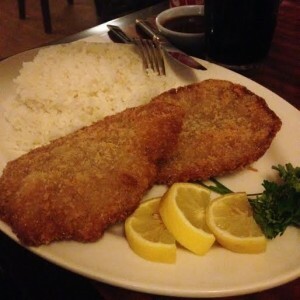 The beef katsu featured two thin-cut pieces of beef, breaded in panko and fried, served with a heaping portion of white rice. The beef was very crispy and not at all greasy, and its gentle flavor paired well with the sweet, A-1 like sauce that came with it. The accompanying miso soup, which was mellow-tasting and the perfect temperature, actually convinced James (a staunch non-fan of miso) to finish his bowl. The small salad also included in the meal was tossed with a light, sweet and slightly tart sesame dressing, shredded carrots and cucumbers. An attractive sprinkling of black and white sesame seeds added a pleasant crunch. Rachel’s California roll featured real crab, and the shrimp tempura was “light-as-air crunchy.” Nate’s chicken teriyaki came with an impressive variety of vegetables like zucchini, broccoli and red and green peppers. The sauce was flavorful but not at all syrupy, as is so often the case. My salmon roll tasted fresh and delicate, though the salmon skin roll was a bit saltier and fishier-tasting than I’d hoped (I’d never ordered it before- I don’t know what I expected). But, it had a very satisfying crunch, and the sweet eel sauce drizzled on top helped to balance the flavors. The nigiri sushi was my favorite part of the whole meal. Small pieces of bright, white squid and perfectly cooked octopus were placed neatly atop balls of delicately seasoned rice. The squid, which had a satisfying “snap” when bitten into, was some of the freshest-tasting I’ve had. The briny, meaty and extremely tender octopus, though, was the star of the show. I would brave Fells Point parking on a weekend to order that, alone. Service at Asahi was prompt, friendly and consistent. Despite a sudden evening rush, our table was never neglected and our drinks never empty. With pleasant well-wishes from our server, we left feeling full, happy and not completely broke, which is more than enough to bring us back again. 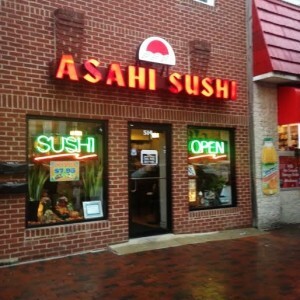 Asahi Sushi, also offers carry-out; it is located at 514 South Broadway in Fells Point.